If I selected the option for the top 4 scores of 8 golfers to count towards the standings, is that the top 4 scores in each round or the top 4 scores at the end of the tournament? The Daily Bests scoring option allows you to score your PGA golf pool by using the top scores from each round. As you can see from the screenshot above, even though Rory McIlroy failed to make the cut for the 2017 US Open, his score of 1 under par from round 2 still counted towards the final team score. This pool chose to count the best 4 scores of their 6 golfers. 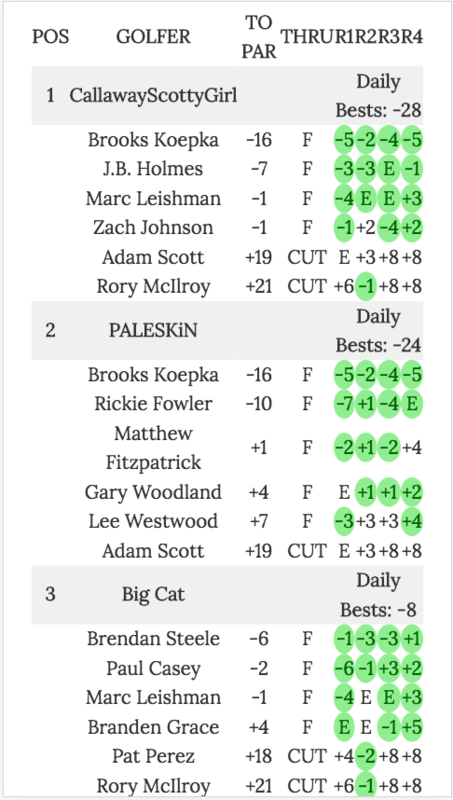 Click this leaderboard from a 2015 PGA Championship pool to see a leaderboard with this feature. Simply click on the “Daily Bests” button to sort the leaderboard. In addition to the Daily Bests scoring, you can use the R1, R2, R3, and R4 buttons to score by each individual round. Just one other option you could use to spice up your pool format with an extra reward for teams. More details on Round by Round scoring here. For example if Player X shot 81 on Rd 1 he was likely not counted for your team’s score on Day 1, but then if he rebounded and shot 68 on Rd 2, he would count for your team’s score on Day 2. Then your final score was truly your 5 best golfers each day. Is this not how the pool works? We’re using 7 out of 8 scores. Is it 7 out of 8 each day and then total what would be 28 scores, or does it end up being just the best 7 of 8 for the whole tournament? For instance, if Jason Day shoots -2 today but is still 5 over for the tournament, his -2 for today would count for my daily score. It offers the pool a better ability to get back into contention if one of their picks just has a bad day. You can host a golf pool for most PGA Tour events. You can get a reminder email for each Major Golf Pool (Masters, US Open, British Open Championship, PGA Championship) by signing up below.